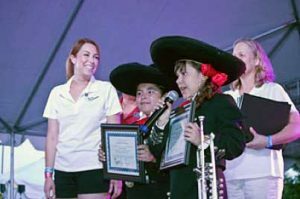 Scholarships are available to students of Mariachi and Folklórico who wish to attend the TIMC. Please attach a short bio about this student along with a photo. Please submit a letter of recommendation from yourself or another instructor in your program who has been working closely with the student and can answer the essay topic. 100-150 words. Essay Topic: How has this student shown great interest and improvement in your intermediate program? Why are they deserving of an opportunity to attend the TIMC next year 2020 as a scholarship recipient? All participating directors must already have students registered for the 2019 TIMC and be in good standing. *The scholarship recipient will be featured at the Fiesta de Garibaldi at the 2019 TIMC Conference and must be present to receive their award certificate. They will receive full registration to attend the TIMC 2020 for any Level I, II or II Workshop (excludes Master Level Workshop). Deadline for submission is Friday, March 15 2019. For more information please email mymusicfoundation@outlook.com or call Andrea Gallegos at (520) 404-3742. Mail application to: La Frontera Arizona Attention: TIMC Padrinos Scholarship Committee 504 West 29th St. Tucson, Arizona 85713.